With the upcoming theatrical release of National Treasure: Book of Secrets on the horizon, Walt Disney Pictures has decided to put out a two-disc collector's edition of the film that spawned the sequel, National Treasure . I liked the movie back when it first came to DVD, but my wife said she didn't care for it, so I was curious to see how it held up. And now that I've just watched this two-disc collector's edition version, I have to say that I still like it. My wife watched it with me, and after it was over she said it was WAY better than she remembered. Yeah, she actually liked it! And why not, it is faced-paced with loads of action and adventure, and just the right bit of comedy sprinkled in. Nicolas Cage plays Benjamin Franklin Gates, a treasure hunter (or as he calls it, "preserver") who is on the search for the greatest treasure in history, the ancient treasure of the Knights Templar. The Gate's family has held onto not but a single clue to it's location, dating back to the 1800s, but none of the Gates has ever succeeded in deciphering the clue. Until now, that is. Ben Gates figures it out, but when he reaches the proper location along with his financier partner, Ian Howe, find only another clue pointing them to the back of the Declaration of Independence, Ben disappointingly gives up his quest for the treasure... and is betrayed! Leaving Ben and his computer-literate partner, Riley Poole, for dead, the bad guys head off to steal the Declaration of Independence, but Ben refuses to let that happen. After failing to convince anyone of the upcoming theft, Ben realizes that the only way to save the precious document is to steal it himself, thus turning the next part of the film into an exciting caper movie. And this is where the pair pick ups up Ben' soon-to-be love interest and fellow history-lover, Abigail Chase. From here, the movie switches switches gears into a full-on treasure hunt mode, taking our heroes to all different types of historical locations. Of course, they unfortunately still have a bunch of bad-guys hot on the trail, and not to mention cops and the US Feds since they stole the Declaration of Independence! The film lasts for over two hours, yet there is little time to rest in this exciting thriller! There is also little-to-no cussing, or blood, or violence, making it great movie for children as well. All-in-all, a well-done film that's obviously not supposed to be taken seriously, just taken as a fun-filled popcorn flick. To celebrate the theatrical release of National Treasure: Book of Secrets, Walt Disney Studios Home Entertainment presents a new, two-disc special edition DVD of the blockbuster adventure that started it all. 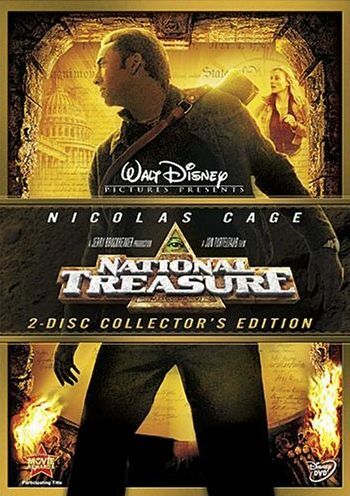 Available December 18, 2007, National Treasure: Collector’s Edition is a nonstop thrill ride that will have action fans on the edge of their seats as star Nicolas Cage deciphers clues from America’s past to unlock the mystery behind the world’s greatest treasure. The Collector’s Edition DVD includes a wealth of bonus material including four new featurettes that take viewers inside the making of this family classic, plus a sneak peek at the highly anticipated theatrical sequel National Treasure: Book of Secrets. Presented in new collectible packaging, National Treasure: Collector’s Edition is an ideal holiday gift for any movie lover. Jerry Bruckheimer, world-renowned producer of the Pirates of the Caribbean franchise, assembled an all-star cast including Academy Award® winner Nicolas Cage (1995 winner for Best Actor, Leaving Las Vegas), and Academy Award® winner Jon Voight, (1978 winner for Best Actor, Coming Home), for this action-packed adventure. Released in 2004, National Treasure generated $173 million dollars at the North American box office alone. The excitement continues December 21, 2007 as National Treasure: Book of Secrets opens in theaters nationwide. In addition to the original DVD extras, National Treasure: Collector’s Edition includes a treasure trove of new bonus features that will fascinate fans of all ages. New featurettes including "On the Set of American History," "To Steal a National Treasure," "Exploding Charlotte" and “Ciphers, Codes and Codebreakers” accompany additional deleted scenes with introductions by the film’s director, Jon Turteltaub (Phenomenon). A special preview will prime audiences for the all-new sequel, National Treasure: Book of Secrets. The More Bonus Material You Find and Watch, the More You Uncover! All-New Bonus Features Exclusive to the National Treasure: Collector’s Edition.